Please include this Syllabus Insert for each of your classes. This document will help your students be prepared for a variety of emergencies on campus. Be sure to fill out the blanks specific for each classroom/building you use. If you have questions about completing the syllabus insert, please go to our FAQs page. This poster was created for your classroom to provide helpful emergency information on how to report an emergency, what to do in a fire evacuation, shelter-in-place directives and active shooter events. 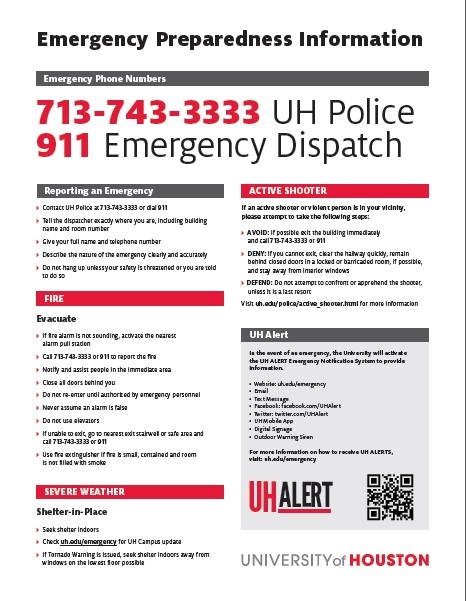 It also includes information on our UH ALERT Notification system. Print and post this poster in letter size or tabloid size as needed.